The view from the top is stunning! Check out the tower at night to see the torch on top’s glowing effect, designed to look like the flickering of real flames. €5 fee for those wishing to see the view from the top. The Tower of the Juche Idea was constructed for Kim Il Sung’s 70th birthday celebrations in 1982, together with the Arch of Triumph and the Grand People’s Study House. It is dedicated to North Korea’s national ideology of Juche, an offshoot of Marxist-Leninism which emphasises independence in national affairs, and North Korean particularism as opposed to the universalism of mainstream Marxist-Leninist thought. 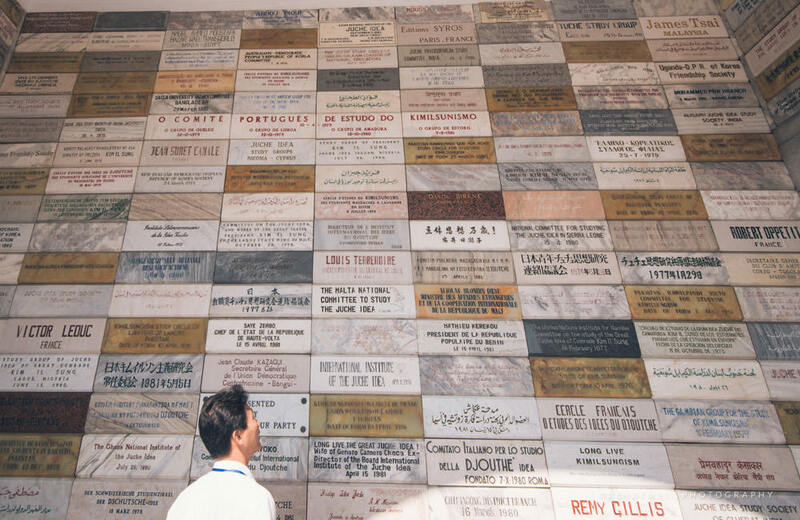 In the entrance to the interior can be found plaques donated by Juche Study Groups and individuals from all over the world. The structure is 170 metres high, and made from 25,550 granite blocks. 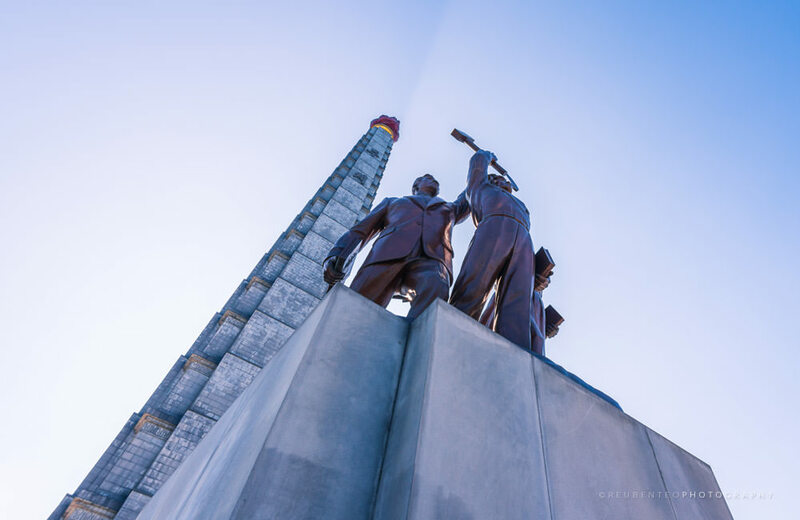 One for each day in Kim Il Sung’s life up until his 70th birthday, when the tower was opened (365×70= 25,550). The dividers on the four sides of the structure add up to seventy. By the structure’s sides are two sets of symmetrically designed apartment blocks. 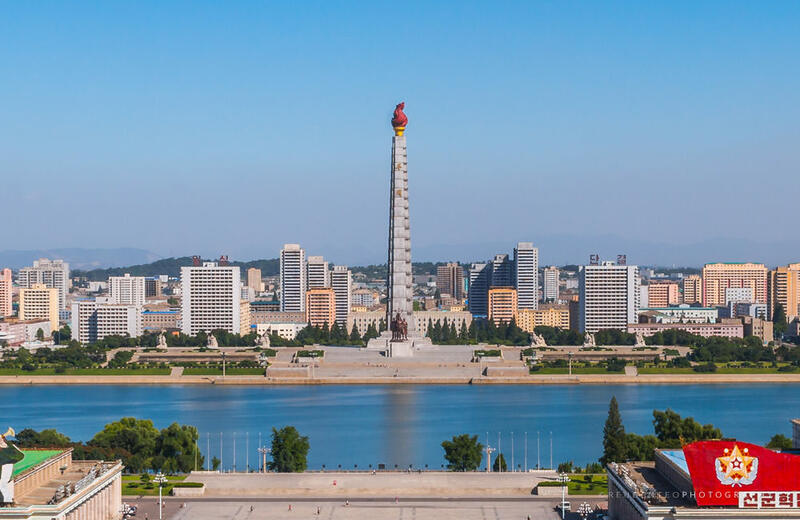 Facing the tower from the front (from the Taedong River or Kim Il Sung Square), the two blocks of Korean characters on each side, together form a four character slogan– “Single Minded Unity” (일심단결; 一心團結). This slogan symbolises the unity of the people and the leaders as one. The golden characters on the front of the structure read “Juche”. A bronze statue of a worker, farmer and intellectual holding aloft a hammer, sickle and intellectual’s brush respectively, can be found at the structure’s base. Together, these three tools constitute the Korean Workers’ Party emblem. The brush of the Confucian intellectual is added to the hammer and sickle of traditional socialist ensigns, and takes a prominent place in the centre. The Tower is found on a monumental axis opposite the Grand People’s Study House. The Taedong River and Kim Il Sung Square are bisected by this axis. 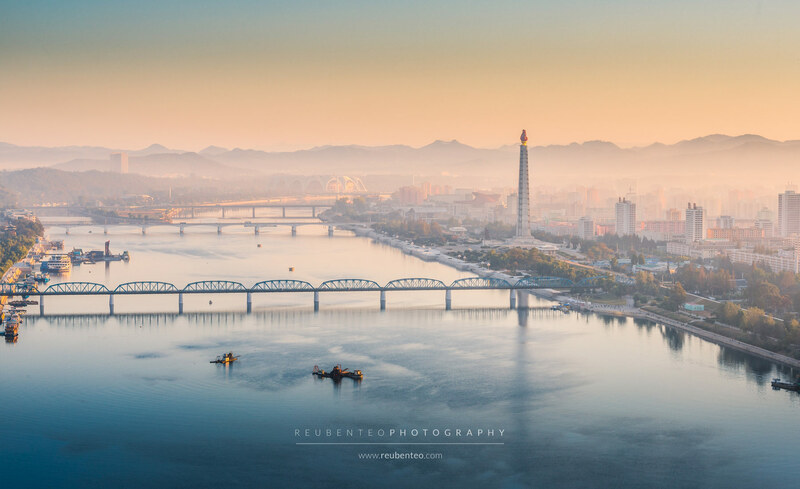 The prominence of this structure is perhaps an indication of the heavy emphasis on education North Korea’s still somewhat Confucian culture places. The Grand People’s Study House found opposite it is also a reflection of this.